a set of rules that determines how the pieces move, when and where and how the game play goes. 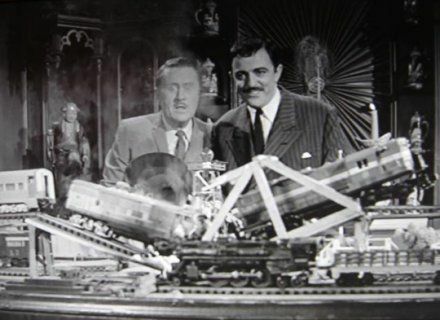 The difference in this game is that there are no winners or losers as people are not pitted one against the other although Gomez Addams may beg to differ. Unlike many other games this one is inclusive where all players work together to achieve a goal. That goal is moving trains across the layout to get a job done in the most efficient way. The rules, should you wish to copy or adapt real railroad rules, come with a quite restrictive rule set thanks to Sir Isaac who’s three laws are rather a hard task master. Add a clock and time limits and the game becomes challenging for all concerned. It is highly rewarding for all that since you set the level of complexity – easy at first and then increasingly complex as you play and understand the nature of the game more. The game play is only limited by your choices. The rules allow you to play the game to a standard. Your focus can be on operating long trains over the entire length of a railroad; switching local industries in a timely manner while using the track space available to find the most efficient means to complete your work. It can be only you playing or many people. It all depends on your level of comfort and your desire to share the adventure. The size of the layout has some influence on the operating scope, large or small. However, a large layout may cover a small area of operation where it covers a single industry and a single interchange. While a small layout may cover a large area of operation with many industries, and more than one interchange. You can read more on this in the next section of ‘Operations 101‘. Outlined below is what I consider each of these operating schemes to be. Represent more than one area (think towns along a line for example), or many places in one area (think large industries). My focus is on small area of operation (SAO) layouts; that will be the focus here also. There are plenty of resources on the bibliography page that you can use to fulfil your need if this is your area of interest. Represent a small and focused area of operations, often a subset of an area. An added benefit of choosing to build a smaller layout is that you can build many layouts over the course of your modelling career. Indeed as many as your mood fancies over your lifetime. Many of the layout builders that I’ll introduce you to have built many layouts over time. Some have built many over the last year or two. There are as many definitions as there are modellers. But, I’ll try to provide a framework for us to work with for the long haul that will allow you to fill in the blanks as your skill and understanding grow. There has to be a definition that makes all of this a lot easier to understand. After many days of thinking, and a flash of insight while making a cup of tea in the kitchen tonight I boiled it all down to this: For a layout to be described as an “operating layout” trains must come from somewhere, do work to change their direction or consist, have a purpose within the scope of the location, and finally go somewhere else. Have a purpose (serve a need in our modelled community). Have a thought or comment that you’d like to share? Please do using the links below.